This pie is light and crunchy at the same time, with it’s unique combination of flavours its truly one to put in your recipe log book. The zest and juice of an orange gives this pie a citrus light flavour and the crunch of filo pastry is a sheer delight. 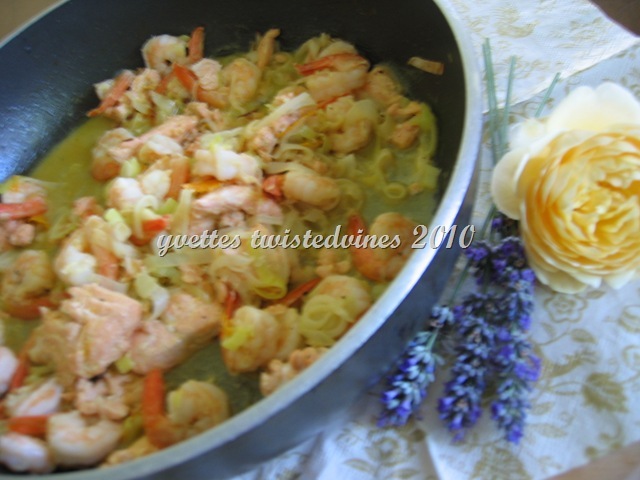 Clean and wash prawns, wash orange,peel and slice finely the zest of the orange and juice. Slice leeks finely, heat 30 grams of butter in pan and cook leeks until transparent, about 5 minutes.Add the zest and juice of orange.Turn the heat up, and cook for 5 minutes. 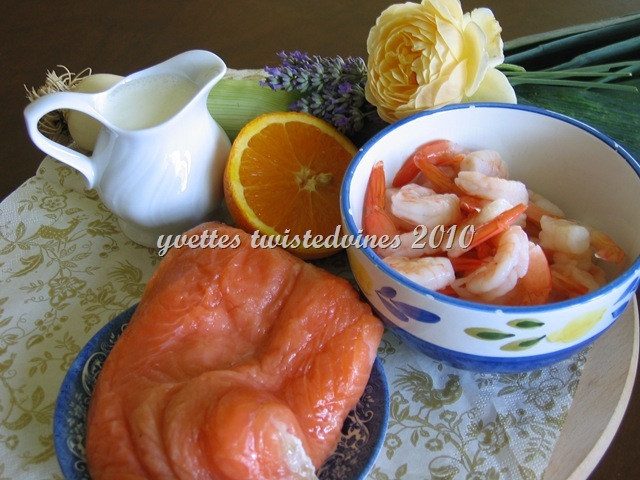 Add the prawns and sliced salmon. Season with salt and pepper.Turn off heat. Beat 2 eggs, add the liquid cream, season with salt and pepper. Add the prawn mixture to the egg mixture and stir lightly. Melt the rest of the butter, and prepare the pie crust. 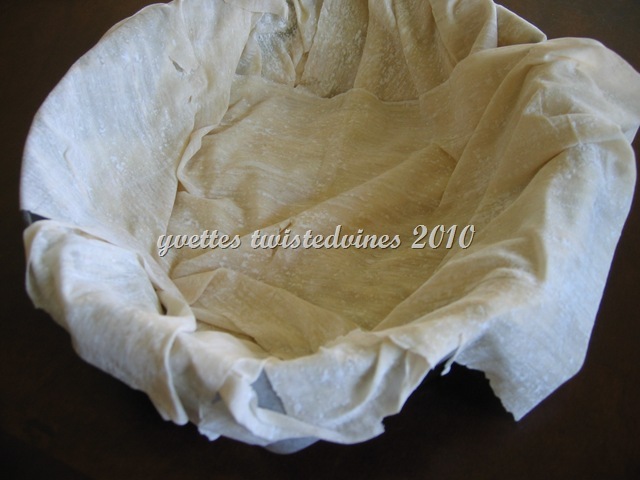 In a high edge 24cm cake tin, line with oven proof paper.Add one sheet of filo pastry and brush with the melted butter,continue layering the other sheets as in photo below. Add the liquid mixtures and cook in moderate oven for 50 minutes until pastry is golden. 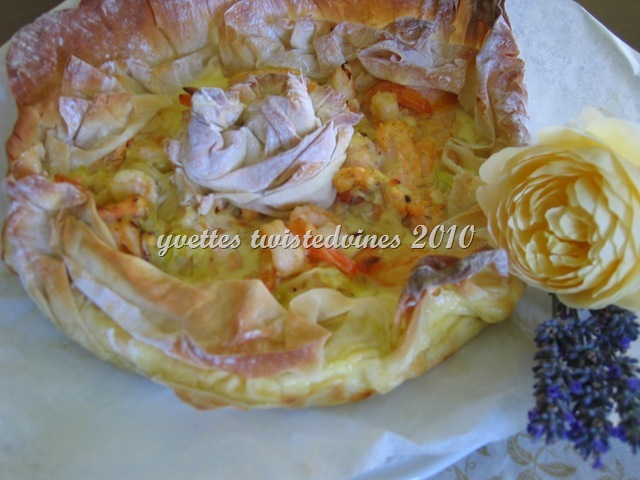 A quick, mouth watering and tasty pie with a zing of citrus orange flavour. Adapted from a recipe in Sale & Pepe. This sounds delicious. I love salmon and prawns! 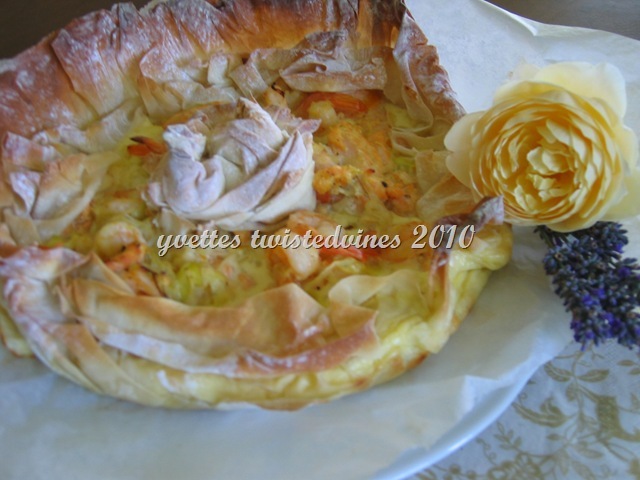 I love working with filo pastry also its a delight with seafood…thanks for calling by.